As many of you know, I went to the Lush Creative Showcase in London last week. It was an incredible experience, full of character versions of bath bombs, speaking sessions, and bath bombs. I didn’t buy a ton there, but I did get some things, and some ideas for what I’ll be buying once I can get to my Lush shop. So let’s get into the new Halloween line! Since space was limited, and a lot of the Halloween items were the same as last year, I didn’t grab all that much from the Halloween Collection. 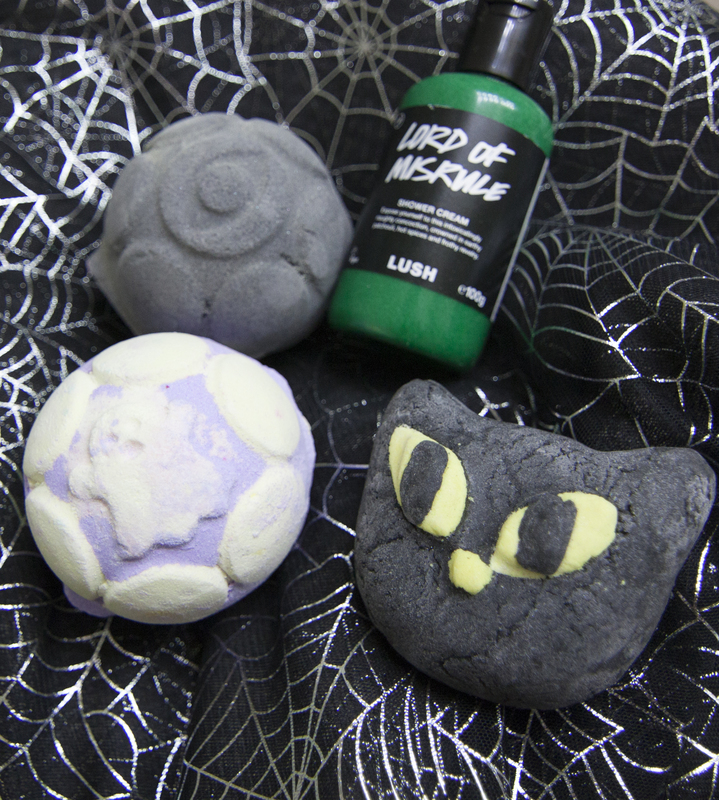 I didn’t buy Lord of Misrule (my favorite bath bomb) because I know that I’ll be stocking up on it now that Lushoween has hit the States. 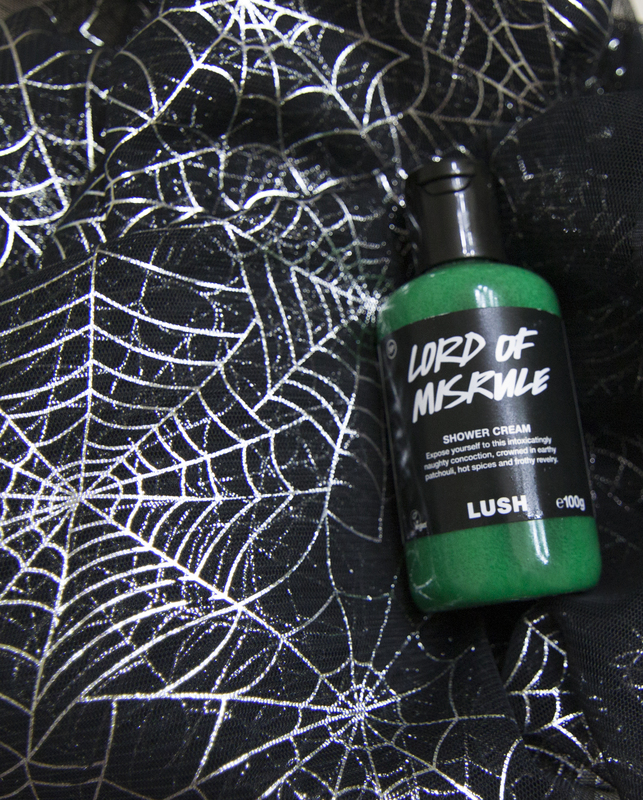 One of the things that was in my Bewitched gift that is an older item, however, is the Lord of Misrule shower cream. I am very much a fan of Lord of Misrule, but the shower cream has always fallen flat for me; it always seems loose, like it’s running off of my hand before I can lather it onto my body. Not anymore though! I tried out the bottle from my Bewitched gift the other day and was blown away by the consistency change. Now, its thicker than Bubbly, lathers perfectly, and leaves you with a slight Lord of Misrule scent as you get ready for the day. I’m so excited! 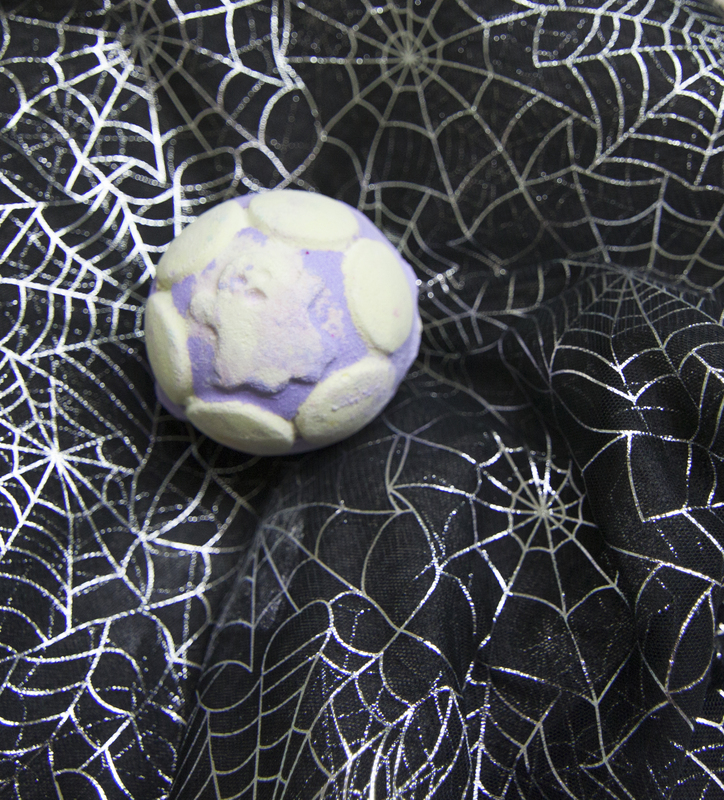 Second in the Bewitched set is Secret Arts Jelly Bomb. This spicy Jelly Bomb used to be called Dark Arts (a la Harry Potter), but they changed it because Halloween. It makes for an awesome, black bath, but it also makes you clean your tub afterwards. It takes awhile to fizz out, which is nice, but I was really bummed about having to clean afterwards. I think this is a great Jelly Bomb for if you’re in a hotel, where they clean consistently. If I were using it in a hotel, I’d make sure to rinse the jelly from the walls of the tub at least. I did really enjoy this bath; I came out feeling super soft and cozy, and after my shower and tub cleaning, I passed right out. I thought this would be a part of the Lushoween Collection in the States, but as of right now, it’s not. You get Lord of Misrule in the Bewitched set instead. Bewitched Bubble Bar is also in the Bewitched set. Its a very soft, spiced scent. I used a little less than half mine and had a lovely bath; it made my skin soft and is great for those of us who aren’t super into spicy scents. Another item I’m excited about is the Ectoplasm Jelly Bomb. This I haven’t used at home yet (I’m saving it because I don’t know when we’ll be getting it in the states), but it was demoed for me at the Showcase. The Jelly Bombs are definitely weird. This and Secret Arts are a part of the Halloween collection, which makes me think we’ll be getting Jelly Bombs soon. They turn the top layer of your bath into a Jelly, which is definitely bizarre. Ectoplasm is bright both in scent and color; it’s almost a neon green with grapefruit scents. I really loved the demo, and I can’t wait to be using it in my own (or a hotel’s) tub! 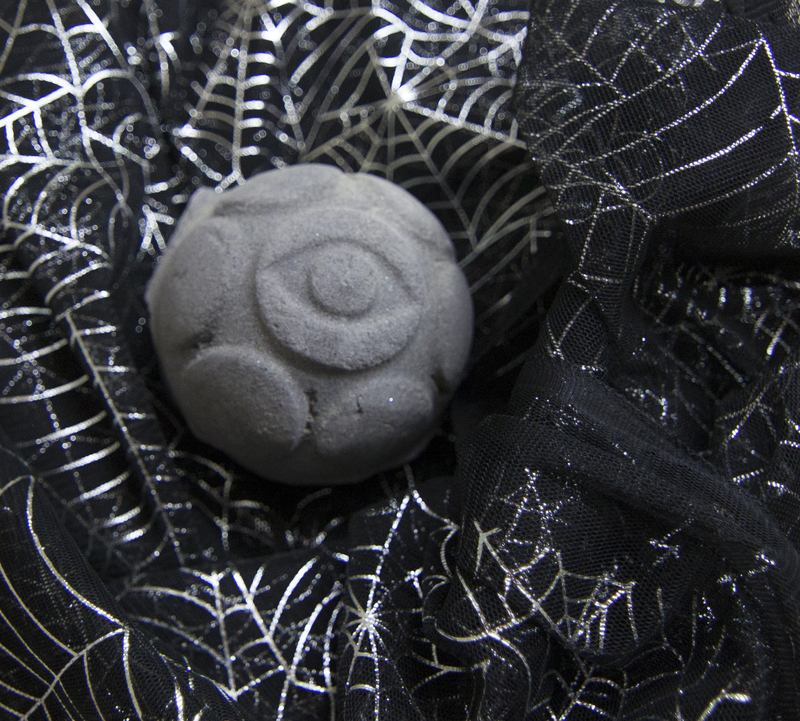 An item that I didn’t grab (but definitely will be, once I can get to my shop) is the Hedgewitch soap. I had bought 5 soaps while in London, and a couple more at Leaky Con, so I didn’t want to continue adding heavy things to my bag, but Hedgewitch smells incredible. It’s full of Blackberries and Thyme, so it’s a sweet, magical scent. I will be getting a big cut of this as soon as I can, because it’s incredible. 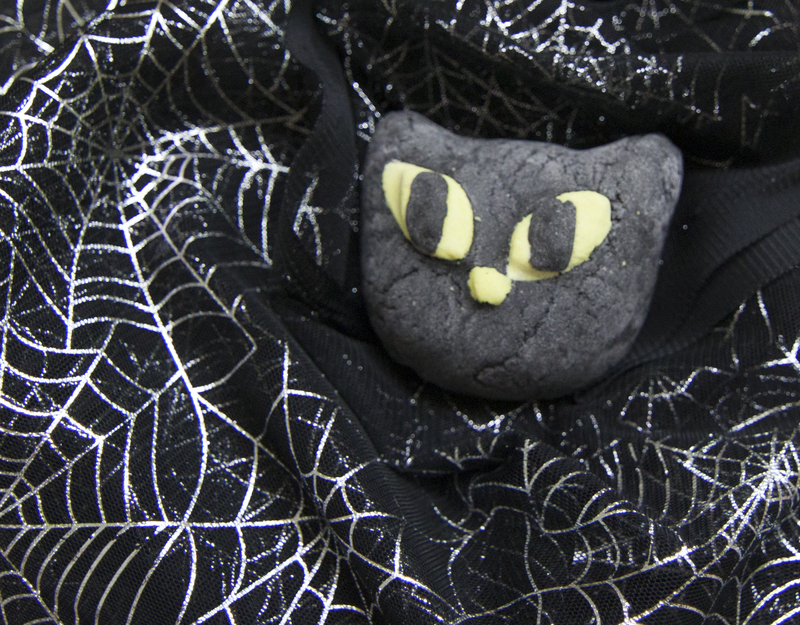 That’s all I’ve got for the Halloween Lush Collection! I’m excited to share my Christmas Lush with you soon, but Halloween always comes first in the year, so it has to come first product-wise!